As we congratulate Manchester City on their Premier League win Barcelona midfielder Andres Iniesta has made a decision on his future whilst Loris Karius could be set for a new Liverpool deal. It's Monday's Paper Round. We start with The Mail, who have quotes from Barcelona captain Andres Iniesta. The 33-year-old has said that he has already decided where he will play his football next season. 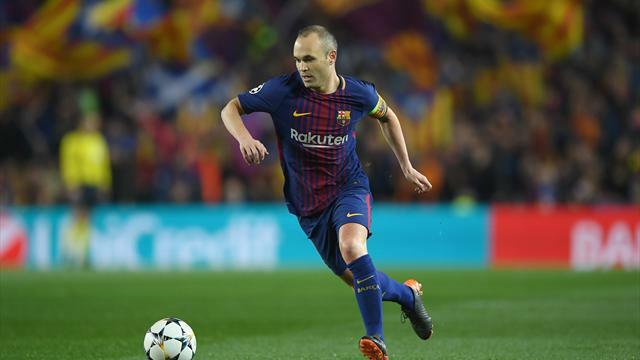 The midfielder has a lifetime contract from Barcelona, which means his deal will automatically renew each year, but there has been intense speculation that he leave the Camp Nou. If that were to be the case he has been linked with a move to the Chinese Super League. Paper Round's view: Call Paper Round a sentimentalist but we love to see players stay at one club for the duration of a career. Give us Francesco Totti over Xavi any day of the week. It'd be brilliant to see Iniesta see out his career in Barcelona. It turns out that Mohamed Salah is just a great team player. After netting his 40th goal of the season on Saturday, Salah spoke to the UK written press for the first time and said that his primary goal is to win the Champions League, rather than individual accolades. Paper Round's view: It's hard not to like Salah, he always seems to come across really well. Of course this is hardly a surprising response from a player, but even still, Salah just seems to be a great guy. There's an exclusive in The Sun that Loris Karius' impressive turnaround at Liverpool could be capped off with a new deal. Karius will get a pay rise on his current deal which is worth £50,000-a-week, but he may have to compete with a new keeper in the summer with Klopp still interested in Alisson and Jack Butland. Paper Round's view: Karius deserves a huge amount of credit for his performances recently but it still feels he may not be of the sufficient calibre for Liverpool to become one of the dominant sides in Europe. Alisson has shown that he can cope at the highest level and would be a brilliant signing for the Reds. We end with a report from The Scottish Sun that has quotes from Patrick Roberts. The winger, 21, is on loan at Celtic from Manchester City and there have been reports that he could join the Scottish champions permanently. However Roberts has said that he is unsure where his future lies. Paper Round's view: Roberts is a hugely talented player but it's hard to see him playing regularly at City in the near future. Moving permanently to Celtic seems like the perfect decision. It gives him stability and European football for a couple of seasons, and then if a bigger club comes calling he can make the move.